According to International Monetary Fund, Globalization refers to the increasing integration of economies around the world, particularly through trade and financial flows. The term sometimes also refers to the movement of people (labor) and knowledge (technology) across international borders. 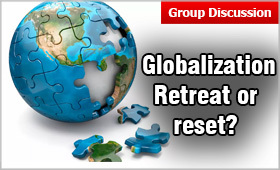 In addition, there are also broader cultural, political and environmental dimensions of globalization. Further, environmental challenges such as climate change, global warming, cross-boundary water, air pollution, and over-fishing of the ocean are also linked with globalization. The creation of the World Trade Organization, World Bank and other major trade organizations their rules and regulations in part, facilitated broad 'global' changes, lowering trade barriers and deregulation of economies. In the aftermath of financial instability, the Government of many developing and poor countries liberalized economies internationally to boost development and attract investment. It is considered that open economies are all better off from trading, as they make use of their resources in most optimal way and offers variety of products at competitive prices. After I970s, Business Corporations and banks based in the most highly industrialized countries were driven by their intrinsic and incessant pursuit of wider markets, further and more profitable investment fields and access to essential resources elsewhere in the world. All these aims of these Organizations, supported by their governments in 'the national interest' pushed for Globalization. Industrial and Financial corporations sought internationalization of their respective products, and investment operations to evade economic, social and political 'impediments' at home as well as to take advantage of more favorable opportunities abroad. The main forces that have driven global integration are technological innovations, broader political changes and economic policies. Greater Opportunity: Global markets offer greater opportunity for people to tap into more and larger markets around the world. It means that they can have access to more capital flows, technology, cheaper imports, and larger export markets. Cross-cultural Integration: Liberalized nations offer multiple avenues for higher education, tourism and jobs to the immigrants of different countries resulting in cross culture Integration. Prosperity: Globalization has helped lift hundreds of millions to escape poverty over the past decades. Populous countries like China and India have enjoyed phenomenal growth, improved standards of living, life expectancy, literacy and employment rates. Outward-oriented policies brought dynamism and greater prosperity to much of East Asia, transforming it from one of the poorest areas of the world 40 years ago. According to International Monetary Fund, 20th century saw unparalleled economic growth, with global per capita GDP increasing almost five-fold. Competition: One of the most visible positive effects of globalization is the improved quality of products at competitive price. As the domestic companies have to fight out foreign competition, they are compelled to raise their standards and customer satisfaction levels in order to survive in the market. Global Challenges: Globalization helped attenuate the major environmental challenges we are experiencing today. Some national and international agreements such as UN Framework Convention on Climate Change, The Kyoto Protocol etc. aim to attenuate the negative effects of globalization on the environment. Unemployment: Due to globalization immigration of labor from developing countries to developed countries has become much prominent and easier. This has resulted in unemployment for the native citizens. The historic withdrawal of United Kingdom from the integrated market of European Union fearing job loss due to immigration and protectionism towards national sovereignty is a case in point. Inequality: The story of the 20th century was of remarkable average income growth, but it is also worth noting that the progress was not evenly dispersed. The gaps between rich and poor countries, and rich and poor people within countries, have grown. According to the World Inequality Report by the World Inequality Lab, because of high and rising inequality within countries, the top 1% richest individuals in the world captured twice as much growth as the bottom 50% individuals since 1980. Trade wars: The US is running large trade deficits with the EU as well as China. In addition to significant trade deficits in goods with Mexico, Japan, and Canada, Mr. Trump believes the trade deficit of US is proof that all its trading partners are unfair to America. As a protectionist measure, Donald Trump, pushed through a metal tariff plan that puts 25% tariff on imports of steel and 10% tariff on import of aluminium. The international atmosphere is full of threats of retaliation and it appears likely that major trading partners with the US like the EU and China will hit back by setting their own import barriers against US. Tax heavens: With different taxation norms in different countries citizens park their illicit or unaccounted money in tax heavens and avoid taxation from their home countries. The revelations made by Panama offshore leaks and Swiss bank case are case in point.